April 2017 Press Release. New Investment type Poised to Stun the Financial Industry. Tampa, FL., May 2018. The National Association of Online Investors (NAOI) has released the specifications for a new approach to portfolio design, and investing in general, called Dynamic Investment Theory (DIT) that changes how we invest at a fundamental level. Developed based on five years of research and development, DIT sets the logic and rules for the creation of a next-generation investment type called Dynamic Investments (DIs) that are able to automatically change the Exchange Traded Funds (ETFs) they hold based on a periodic sampling of market trends. By doing so they are “market sensitive” and capable of producing returns that are multiple times higher than standard MPT-based portfolios in use today - with lower risk, absolute protection from market crashes and no active management required. As an example, the simplest DI created by the NAOI that rotates between only Stock and Bond ETFs using DIT methods earned an average annual return of +26 % for the decade from 2008 to 2017 with less risk than simply holding a bond mutual fund. DIT was developed by the NAOI to be a superior alternative to Modern Portfolio Theory (MPT), today’s "settled science" approach to portfolio design. The problem is that MPT it was introduced in 1952. Markets have evolved significantly since then (as illustrated in the following chart) while MPT methods have barely changed at all and they simply don’t work in today’s markets. According to NAOI President, Leland Hevner, “There comes a time in the life of any system, whether it be biological or technical, when it must evolve to survive in a changing environment. This time has come for the world of investing as MPT methods are increasingly unable to cope with modern markets. DIT is the adaptation needed for investing to "evolve" and remain viable now and well into the future. The NAOI teaches both individual and professional investors how to design, implement and manage Dynamic Investments and also consults with financial organizations to enable them to increase revenues, capture market share and gain a massive competitive advantage by offering innovative DIT-based solutions. Detailed information is found at www.DITheory.com . About the National Association of Online Investors (NAOI) - Founded in 1997, the NAOI is the market’s premier provider of objective, college-level investing education to the public as well as a leading investment research and consulting organization. A detailed description of how Dynamic Investment Theory was developed and how the Dynamic Investments it produces work is found in the 200+ page book called "The Amazing Future of Investing" as shown at right. Readers will be able to Implement and Manage Dynamic Investments immediately upon completion of the last chapter. To learn more about the book and to purchase it go to the NAOI Store at this link. Of course when considering a change as significance as that represented by Dynamic Investments, any interested party must ensure that the source has credibility. My background and credentials are found by clicking here. I summarize this information below. 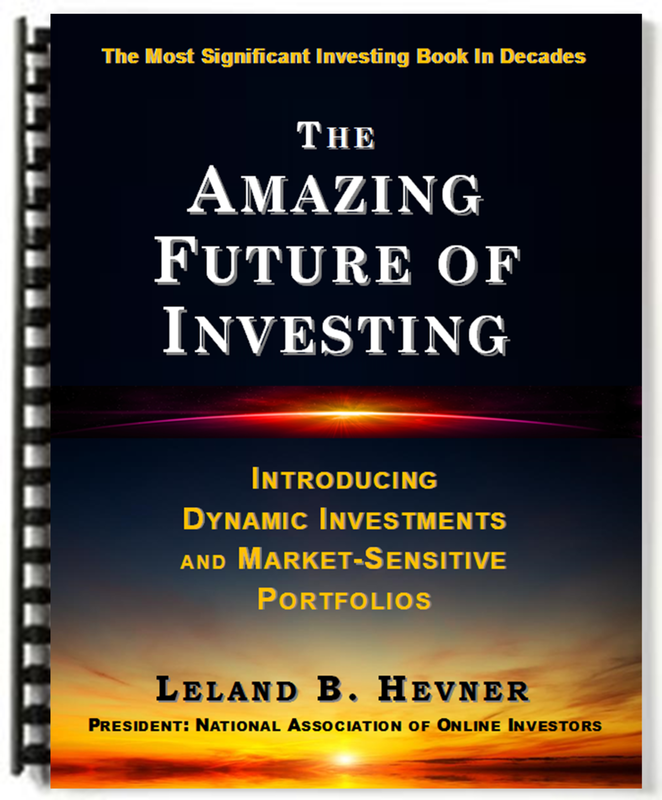 Leland B. Hevner is the President of the National Association of Online Investors (NAOI), an organization that he founded in 1997. The organization has grown to become the market's leading provider of objective, college-level investor education. He is a self-directed investor, a certified Financial Advisor, a teacher of personal investing at the college level, a consultant to financial organizations and governments, an author of multiple best-selling personal investing books, an investment researcher/innovator and have been a frequent commentator on major TV and Radio networks. He has also been quoted extensively in the print media including the Wall Street Journal, Barons and US News and World Report among others. My niche area of expertise is my unwavering advocacy for the fair treatment of the average individual with money to invest. It is a viewpoint rarely heard, and a "side" rarely taken, in the financial media today. You can review my media exposure by scanning the NAOI Pressroom. You can keep up to date on Dynamic Investment developments by joining our Update Email List at the bottom of this page.